Labour and knowledge is a source of success in every profession. If you have no talent, then—learn, read, study, practice and work as much as you are able. It really helps to succeed. Google forms changed. How to update the code used before? In my many site templates I used Google forms instead of custom php forms. Google forms are very comfortable and organized way of collecting emails sorted by topic or audience. I used to take default code provided by Google, change it slightly, style it pretty and inject into sites. Now Google change a little bit its code and many users of my templates are stuck. In fact it is very easy to make it working again. Below I described those steps which are required to get your Google form agin working and well-styled. 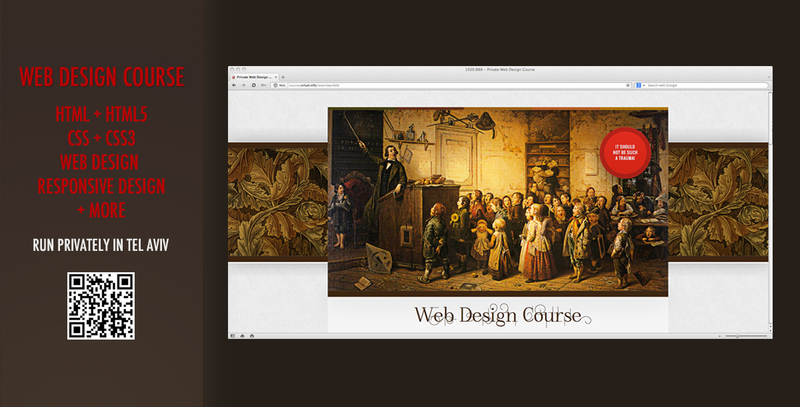 I have launched a private course of web design for Tel Aviv residents. The course is for people who wish to learn properly web design principles, who wish to become professionals in the industry. It is aimed to provide a person with deep knowledge of how to design beautiful websites, to code them manually, to use common sense and feeling of aesthetics. There is no room to drag-n-drop systems, WYSIWYG editors, fast and dirty work. It is about crafting websites only. Here is a presentation page I created especially for the purpose to give maximum of information about the course. New premium Blogger template released: "Gothica"
My latest template "Gothica" crafted for Blogger is just out now and available for sale on ThemeForest Marketplace. Template is carefully crafted, it has so many wonderful features, effects, elements. You are welcome to visit template About Page to get familiar with everything it offers. Template is fully responsive, not only its layout but all elements as well, even adSense. As known, Google ASense banners are of fixed size. It is pretty uncomfortable when it concerns responsive websites, yet build in percents (like this very blog). However, certain workaround is possible. Just yesterday I found a fine article that explains in clear language that very technics. The technics works really fine, especially if a layout is built in pixels and controlled by media queries. Extra question, either is how to implement this technics into Blogger. I have a separate site (based on Blogger, naturally)–Blogsy which showcases all my templates done for Blogger CMS platform. For a while I could not find time to update it, add newly released items and "brush it up". But finally, I did it. Sometimes, designing our templates we give style to labels where a comma placed in between them just destroys the visual look. It is extremely easy to remove a comma. Here is a small tip for those who do not know about this tiny trick. On this very blog the comma in between labels is pretty to the point but on the screenshot below the labels would look a little bit worse if we preferred to keep the commas. Hello, my name is Tanya and my web design studio is entitled “Virtuti-D”. I am working mostly for Envato Marketplaces (ThemeForest, CodeCanyon) and along with I make some extra works in web design. Here is a set of articles helping in customisation of my templates + additional things like reviews, personal notes and so on. Maybe one day I shall add anything else, I do not know yet. If you wish to contact me please do it through my Facebook, Envato profile or via my website. You can also leave comments under articles.